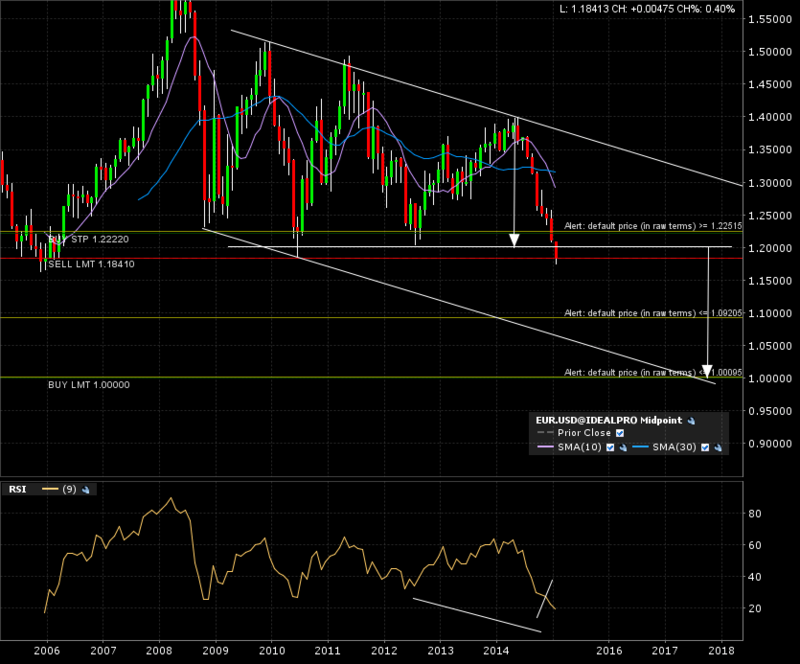 Continuing with eurusd to demonstrate risk and money management. After spotting breakout patterns in monthly, weekly, daily charts, we can’t enter the trade right away. We need to figure out if the “juice is worth the squeeze”. This is our risk to reward (ri:re) ratio. I won’t enter a trade if the ri:re is less then three. Ideally, I’m looking for 1:3 and over ratios. My risk and money management protocols will give me a positive net, if I just hit my target 33% of the time. My money (capital) management protocol dictates I won’t risk more than 0.5% (half of a percent) of my NAV (net asset value) per trade. For a 100k NAV, I would take a short position size giving me a potential loss (entry to stop loss) equal to 0.5K. I would have to be wrong 200 times in a row to be totally wiped out. Even a 20 losing streak would give me a drawdown of 10%. Like they say “live to fight another day”. With these metrics, I’d strongly consider entering this trade. I’d also look at the evolution of the chart if the 50% target is hit. A chart “morphs” over time and different classical chart patterns may emerge. An early exit is possible at that point. (Important note:I do not set the alert at 50% anymore. I decided to lower my risk to reward ratio using target considerations to increase my probabilties of reaching my target. The drawdowns of landing on an “emotional landmine” was greater if I altered my trading framework, by starting to make early exit exceptions on a case by case basis). I have no idea what the price action will be tomorrow, all I can do is protect my capital with sound money management protocols and manage my risk to give me the best return every time I risk my 0.5%. ← Using eurusd to demonstrate “Top to bottom” approach.